While many people are busy digesting what the low-impact SuccessFactors Q1 2017 release is bringing I have spent some time checking out a nice feature that is officially being released with the Q2 2017 release. I know, it is quite early – but it is so interesting I could not help. It is one that we at GP Strategies know a lot of folks have been waiting patiently for – and now it is demoable! It is the so called “Company Structure Overview” – probably people will call it “Org Structure” or something similar or what the marketing team at SAP comes up with once we get closer to final release date. One limitation we and our clients have had until now is that the “Org Structure” in SuccessFactors has merely been the “employee manager hierarchy” or the “position hierarchy”. We have not had any “org structure hierarchy” visualisation. For companies where this has been wanted have had to go elsewhere to third party vendors; of which there has been several. Interestingly, when Employee Central was first pitched by SuccessFactors in 2010 (yeah, that’s a very long time ago) I recall one of the fist photoshop beta images I saw was of some org structures to explain that EC was more than just employee manager hierarchies. So – we have waited 7 long years … now the wait is finally over. Once configured, the Company Structure feature is located under main menu Organisation as you would expect. 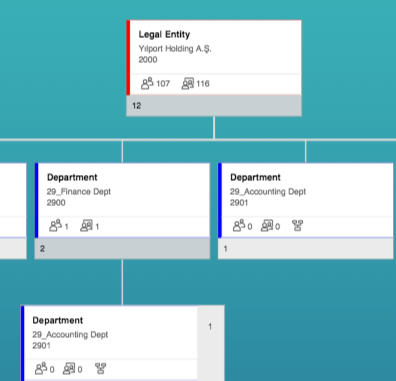 Visually it is nicely aligned with the Fiori standards and uses same navigational features as we know from the regular org chart and position org chart. Good for rolling out. Like the regular org chart and position org chart it is zoomable; Like the position org chart it is also effective dated which is very useful; you can print and export to PDF or JPG. Dragging and clickable insights are also available. You can see how many employees are related to each org structure, with drill to detail. 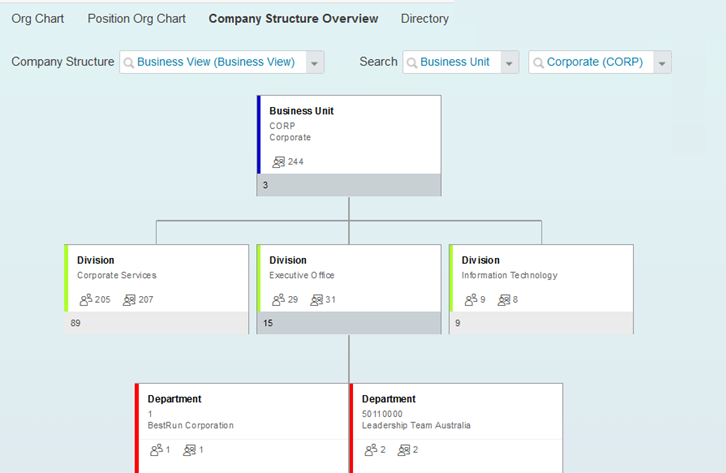 If you use SuccessFactors Position Management you can also see how many positions are related to each org structure. The diagram allows you to quickly see historical changes for the org unit; a pain point we have heard many times. Prior to this you would have to find the unit in admin center and see the rather technical view there. This is much more user-friendly and powerful tool. Oh by the way, this is permission controlled so you can let this be possible for HR but not regular employees. A nice little feature is that you can also click on an org unit and see the People that are related to it (this is configurable, see sections below). The popup allows you to search for users and navigate to their profiles via the user quickcard. Again, a well thought of functionality that we are sure many customers will love. Similarly to employees, you can also see Positions related to the org structure, and like you can for users you are also able to search for positions and navigate to them via direct quick-links (if you want to read about positions, check out my article on SuccessFactors Position Management). Technically you could also use positions in the organisation structure since both are built on the same MDF infrastructure. Technically this innovation is implemented as MDF Metadata Framework (now better known as SuccessFactors Extension). After enablement, the configuration is all done in Admin Centre and is available for customers as well as partners to perform (coming from GP Strategies I would of course recommend using a partner for the initial configuration of course). The configuration takes place by defining which structures and objects you want to allow display of, as well as what you want displayed on each node. Below example shows some of the capabilities. First, you need to define the company structure and which entities you want to use. Second you define the UI. This allows to define certain aspects. In addition, on each element (node) you can define which fields to display. For example, if you have a “Department Head” on the Department object you may want to display that. If not – just don’t add it. Any field on the org elements can in principle be shown, just make sure it is something that makes sense to end users. The end result is that you can allow end users to see visualisations of your organisation entities. You decide which entities to visualise and certain aspects, such as if you want to show a photo of the department head and whether to count # of users per element. As can be seen the functionality is configurable so if you did not follow the standard 100% but created your own org relationships you can still decide what org structures to display. There are still some unanswered questions about the functionality and we are sure that version 1.0 will be followed up by significant updates in the coming releases. We are am also sure that the large group of 3rd party vendors who have provided ”external but integrated” org structure capabilities will have a lot of things to comment on (probably about all the limitations and the wonders of their own tools). But my concluding remark at this time is that the new feature is likely to make a big impact across many organisations who have implemented Employee Central and who have lacked org charting capabilities. Whilst the ”Company Structure” overview may not offer as many features as you can find in 3rd party tools, the configuration options, reporting options and tight data integration with the rest of the suite is certainly a huge pro. We at GP Strategies expect this feature to be a must-have feature by the end of 2017 for all companies using Employee Central. If you have any comments or questions please do reach out to us. Erik Ebert, GP Strategies is an experienced SuccessFactors Solution Architect with 12 years experience in SuccessFactors and 25 years in IT professional services. Nice to see this feature. “Org Structure” is the feature which most of our SAP ERP HCM customers wanted to see in SF EC. I enabled this feature in provisioning in my demo instance ,salesdemo. what bother me is that I can not configure the company structure definition as you did. Hi miss Xie. How are you? I’ve been trying to enable this feature in my demo instance, but couldn’t find where to do it. Can you, please, explain me how did you achieve this? “First, you need to define the company structure and which entities you want to use”, please correct me if I am wrong, for doing this activity I am creating an entry for “Company Structure Definition” base object in “Manage Configuration UI”, but as soon as i save it, the values get deleted and nothing comes up on the screen. And when I am trying to create an entry for “Company Structure UI Configuration” base object, it shows blank entries in the dropdown “Company Structure Definition”. I am not able to find any implementation doc yet, please let me know how do I proceed. Thanks Erik for showing us this. 1 – Manage Employee Central Settings -> switch on Company Structure Overview. 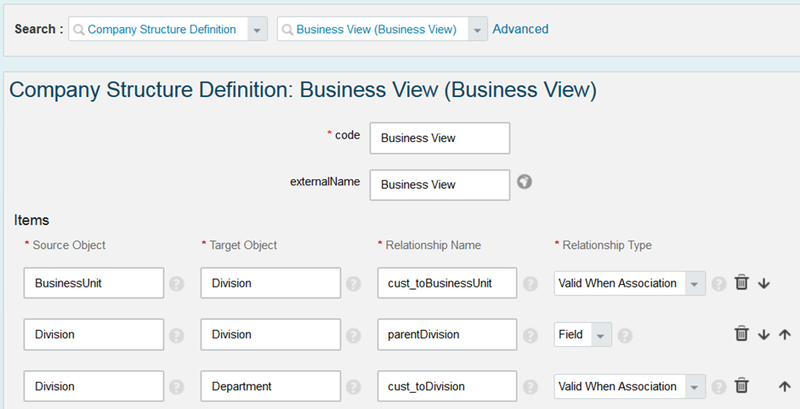 2 – Configure Object Definition -> Company Structure Definition -> Change Permission Category to Misc Permissions. Do the same for object Company Structure UI Configuration. Administrator Permissions -> Company Structure Overview, and flag all options. User Permissions -> Misc Permissions -> Flag View and Edit for Company Structure Definition and Company Structure UI Configuration. 4 – Manage Data -> Company Structure Overview -> Create a company structure as described in the article by Erik. 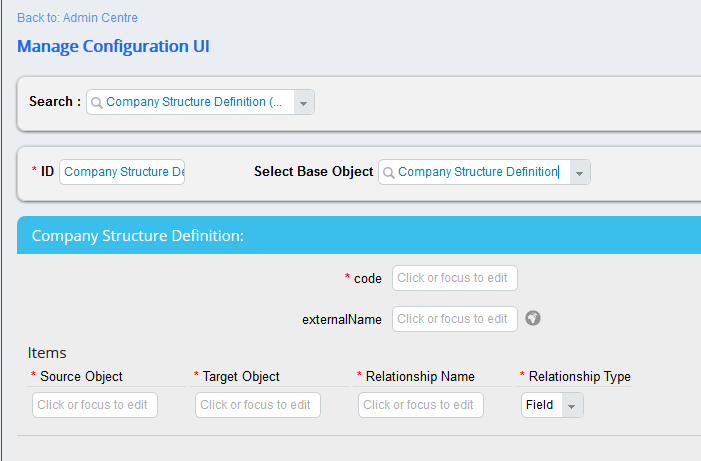 5 – Manage Data -> Company Structure UI Configuration -> Create UI for the structure defined in the previous step. After these steps, the Company Structure Overview can be opened. I have to say it looks really good and the customers will really like it, especially since the chart contains many links to useful information, like history, employees, positions, etc. I am stuck at the step number 4(as per your comment above) . In the configure object definitions, we do not have the relationship as “Valid when Association” ; we only have the relationship as “valid when” . How do i overcome this error and save my configuration for the “Company Structure Definition”? Has the documentation come out yet? I cannot locate it? We made association between Department and LegalEntity. In the company structure overview, sub departments are visible 2 times, due to association between LegalEntity and Department. How can we hide sub departments connected directly to LegalEntity ? Hi, is the above issue mentioned by Sefa solved in Q3 2017 release? Erik Ebert Can these org changes be reported out for different time periods? Also, what is the best object to build a supervisory org unit hiearchy from CEO down to an Individual contributor?